When it comes to reducing visual signature in crowded public environments (of course when such need is required), the attempt to conceal one’s appearance is often easy and quite simple. All you need to know is the local mentality, culture customs and traditions and the yes & no’s. What isn’t easy actually is to remain effective, mobile and practical when working under low visibility or in clothes that aren’t supposed to show your tools or your designation. Disclaimer: By low profile we are not referring to any of the latest Bourne. By low profile we refer to a reality where you might be on your way to a meeting, training or perhaps where you are in active contract and well, you are really not into compromising any clue as to what your role or profession is. Before we go little bit in depth, there is one thing worth taking a look at, and that is the consistency in design and production that UF PRO has shown for years. You might be sitting right now wondering “who cares”, but consistency is the remnant of understanding of knowledge, concept & foundations. For starters, everything from the design of the pockets to the way the stretch material is placed, there is not so much difference in comparison to the other successful products of UF PRO, in particular the Striker XT / HT variants. However, unlike in these models, the P40 Urban Pants has a different and much more modern task since a BDU pants for example, and that is to look like any other casual pants without giving up the ability to store the tools of trade. As always we will break down the pants into obvious but important parts. Since UF PRO has a very nice consistency of design, we will base this review on a comparison between the P40 URBAN PANTS to the STRIKER XT GEN.2 COMBAT PANTS. Several years ago, the stretch material did to the clothing market what smartphones did to the old phones back in the days. The potential was acknowledged and many designs went into the market like mushrooms after rain. But there was a small problem – the design itself. The issue with stretch material (aside other things) is primarily how much and where you are going to use it. Stretch material in wrong locations will actually decrease the product´s functionality and durability. In the Urban pants the case is the other way around, and also similar to the rest of the P40 family. The stretch material is primarily located around the pelvic area, between the legs and the upper part of the back of the pants. However, UF PRO recognized that one piece of stretch material might compromise that region, where heavy weight is likely to be found. In the urban pants, the consistency of the stretch material is disrupted, and as you can see there is a strong stich and a fabric in a rainbow like shape, which makes the back pockets quite durable as well. The upper part of the Urban pants has a modern and different look in contrast to the common tactical pants. If you look closely, the different design of the pockets looks more tight and compact rather than lose and “bulky” in a way. In the Striker XT2 or the P40 All-Terrain pants the pockets are bigger and easier to access due to a wider and rather rounded design, which is normally great. But looking at it from a rather “low profile” perspective, such design will spark associations with traditional tactical pants like BDUs for example, and will draw interest quite fast. Instead UF PRO took a different, more symmetric approach which resulted in clean, modern design cuts that still allows the same storage capacity and accessibility but with a reduced visual signature, especially when wearing a jacket or a wider shirt, as it will cover those pockets. Another added “feature” to the pocket design is a thicker layer of fabric, which allows a better retention for any clip on that you may have on your knife or flashlight for example. Personally I find it great, since in my XT Gen.2 the clip-on wasn’t tight enough for a proper grip and the knife used to slide to the corner of the pocket. In addition to the improved grip, the extra layer of fabric will technically allow more durability. It is important to remark that just like in the rest of the pants of UF PRO, the pockets include additional concealed pockets, which can be closed by a zipper. As a unique feature for the P40 Urban pants the special pocket offers a tight yet relative comfortable to access compartment to any smartphone. The compartment itself is based on stretch material, meaning its tight frame could still fit wider devices. In addition, the placement of the "special" pocket is quite practical, as it is located not too much in front or too much in the back of the thigh. The benefits? A more comfortable and rather concealed location that remains comfortable even when seated in the car. Israeli Bandage. Pefectly fits in. Requires a bit of force to slide in. Easy to take out when needed. Glock magazines. Passing perfect. Keep in mind that inserting one mag might not keep the mag 100% secured. For us this pocket will be great for storing and having mags on the go - but deifnitley not as a direct source of ammunition. Still great and secured when using two mags! Personally I am addicted to the little details. As they say, devil is in the detail. Something nice in the design of the phone pocket is that the “shell” itself, which is made by the Schiller stretch material, is virtually “disconnected” from the main fabric of the pants. The reasons? Comfort. Not only that the device is not “forced” to the pants´ movement, such distance from the fabric will allow you also to use the pocket for more than just a phone, should you want to store another item. The "special" pocket without an Israeli bandage. The "Special Pocket" with an Israeli bandage. Note the shape and the flexability of the Schiller material. Note the distance between the Schiller stretch based compartment and the fabric of the pants themselves. Speaking of other items, I find that compartment to be very useful for storing several important items, which in my line of work should be always present on your first line of gear. Items like A CAT tourniquet and Israeli bandage can be easily stored and accessed. While I am always disturbed by tight pockets in this regard, I have to say the approach of design mentioned above, eliminated that negative experience. The ventilation pocket is yet again another consistency in design by UF PRO. Just like in their Striker HT Pants (for Hot Terrain), which has two zippers that can open two mesh pockets for air, the P40 Urban Pants has the same feature, which is this time located on the thigh level and placed on the sides. 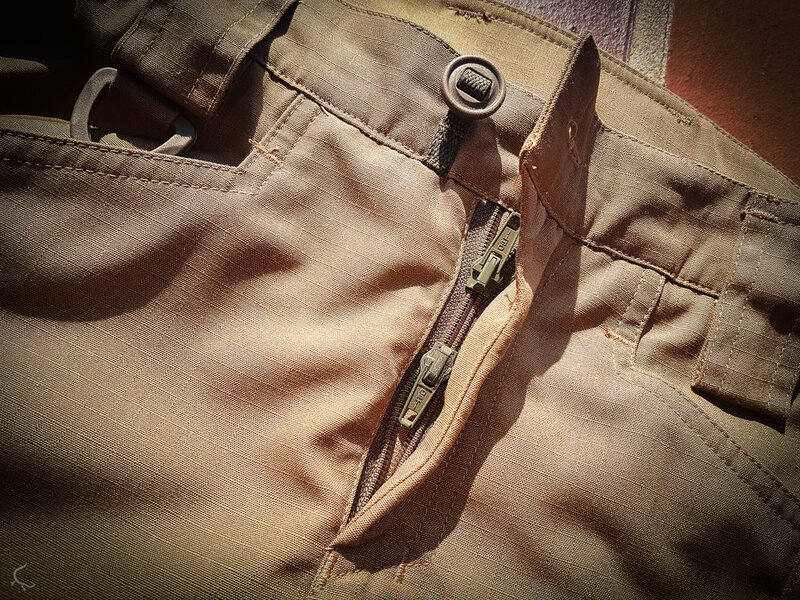 Pretty much like with the HT pants, the pocket is accessible with a zipper. Once you open the pocket, the only thing that stands between the pocket and your skin is a mesh net, which allows precious fresh air to flow into your pants. Might sound fancy, but in the middle east you will appreciate it. 1. It is a mesh net which is designed for air flow. It might not be strong, therefore its durability and comfort with heavy items may vary. 2. Avoid storing thin paper like items (passport, etc. ), since in hot weather sweat could come through the net and damage perhaps your items. Rather than that, I personally found it out to be a very efficient storage area for laminated maps, wallet, and additional off the record items. The fact that the zipper is very well concealed, makes this pocket rather attractive in terms of efficiency of storage. While there is not so much to expand about the lower part of the trousers sleeve, we still feel that it is important to remark that unlike the other tactical pants of UF PRO, the lower part of the sleeves does not have an adjustable shock cord. In addition, UF PRO added a thicker and also wider protection layer (cordura) to the ankel part of the sleeve for the purpose of protection. Altough this might be a personal preference, I prefer tighter pants rather than the looser BDU style cargo pants. The issue however with tight designs is, that when wearing boots or various "funcitonality" boots, the sleeve can not go over the boot, which results in a clumsy yet obvious apperance. In the case of the P40 Urban pants it seems, that the end of the sleeve is actually a bit wider in comparison to other models, which allows to cover most of your boot. My conclusion might not be your conclusion. But when it comes down to carrying a comfortable, not-tactical-looking clothing that allows me to remain practical, the P40 Urban pants are what I would personally belive to be "it". The pants has a modern slick design, a neat color (Kangaroo, as named by UF PRO) and a rather decent balance between being practical and feeling comfortable, while of course maintaining a low visual signature. You can get the P40 Urban pants HERE.